If you are shopping for the perfect grill for your new outdoor kitchen and living area, consider the award-winning Memphis Pro Stainless Steel Built-In Grill by Memphis Grills. Expertly designed and crafted of commercial grade stainless steel in the USA, this grill is as adaptable as it is well-made. The Memphis Pro 304 Stainless Steel Built-In Grill is fueled by hardwood pellets, which offer you clean, convenient, cost-effective heating. It is a “3 in 1 Cooking Center,” offering the option to grill, smoke or bake! That’s right; this fantastic built-in has a high temperature grill, a “Low ‘n’ Slow” smoker and a multi-purpose convection feature. You can literally grill meat or veggies, smoke a pork loin and bake a blackberry cobbler, all on this one lustrous and robust stainless steel unit. 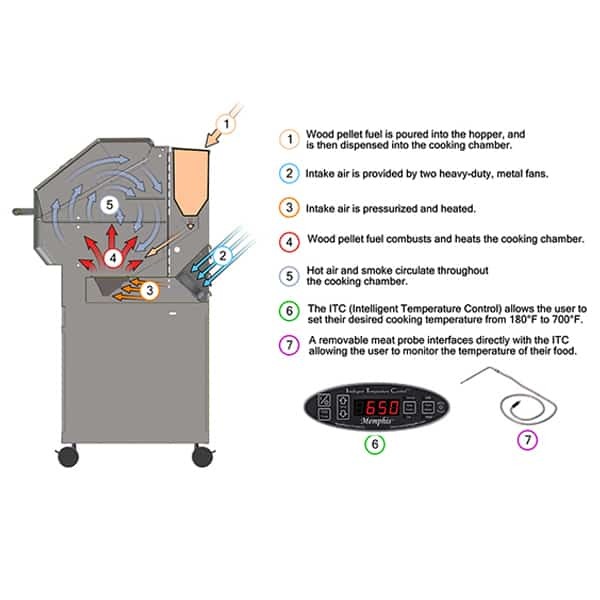 The Memphis Pro Stainless Steel Built-In Grill also comes standard with its unique Intelligent Temperature Control which allows you to control and set the temperature (between 180-650 degrees) at the push of a button. A beautiful and functional addition to your outdoor grill island, the Memphis Pro 304 Stainless Steel Built-In Grill is proudly and skillfully manufactured in the USA.